We see a lot of used wheelchair accessible vehicles in Banbury, Oxfordshire, here at Mobility One, but the Volkswagen Transporter T32 is by far the most spacious and tallest vehicle we’ve ever had in stock. 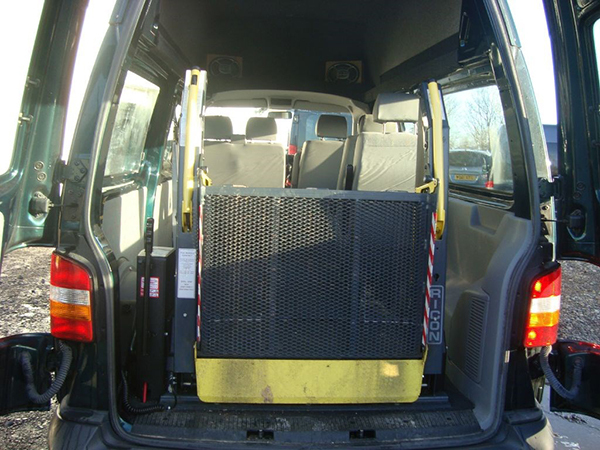 With a full length tracking system, seats for five additional passengers, a four point wheelchair securing system and a best-in-the-business Ricon tail lift at the rear of the vehicle, it takes the hassle out of travelling for those with restricted mobility and their families. This extraordinary used Volkswagen for sale here in Banbury also refuses to sacrifice modern features for accessibility; it has all the bells and whistles, including air-conditioning, anti-lock brakes, power steering, CD player, alloy wheels, central locking and electric windows. This five door, five speed, front wheel drive van is in beautiful condition with just 34,320 miles on the clock. It also boasts a 1.9 turbo diesel engine and a braked towing capacity of 2.5 tonnes. Mobility One is also proud to offer a comprehensive parts and labour warranty included in the sale price, and is ready to discuss financing packages. We are happy to take any vehicle in exchange – just ask for a price. While some of our used cars are in Oxfordshire, we do provide a nationwide service so please give us a call if you’d like to benefit from an at home assessment or test drive. All of our cars come fully serviced and valeted, with a new Ministry of Transport test and with the timing belt changed in line with the manufacturer’s limits. If what you are looking for is a spacious, stylish, Volkswagen wheelchair accessible vehicle in near-new condition, that isn’t missing any of the features of a normal on-road vehicle, this Transporter T32 could be the van for you! Give Nick a call on 01869 331441 to discuss it further.